The Stack is responsible for keeping track of the running memory needed in your application. Heap doesn’t track the running memory. It is just a pile of object which can be reached at any time. It is dynamic memory allocation. Line1: When Line1 is executed the compiler allocate small chunk of memory in the Stack. Line2: It allocates memory for y on top of the first memory in Stack (LIFO). Line3: Here an object is created. 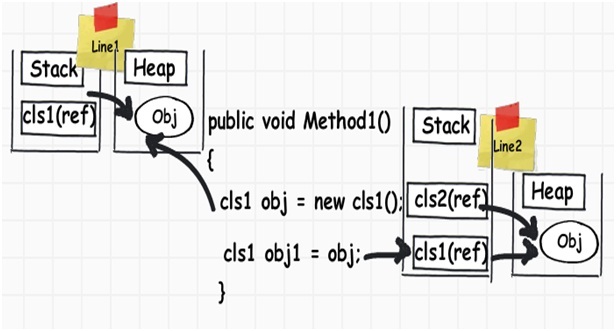 When this line is executed it creates a pointer on Stack and the actual object is stored in a Heap memory. doesn’t allocate memory for an instance of Class1, it only allocates a stack variable cls1 (and sets it to null). The time it hits new keyword, it allocates on “heap”. 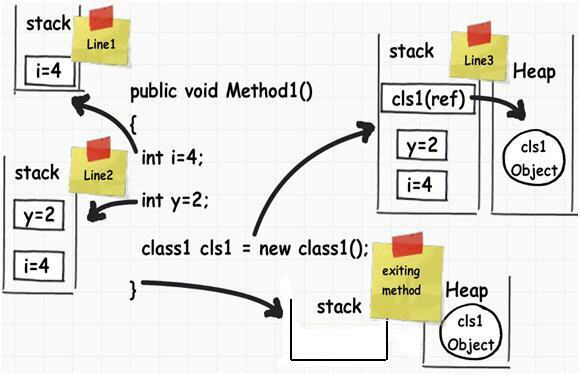 On exiting the method, it clears all the memory variable which are assigned on Stack. But it didn’t de-allocate the heap memory. This memory will be later de-allocated by the garbage collector. Now we have discussed about the Stack & Heap memory. Let’s move on to Value & Reference Types. 1. 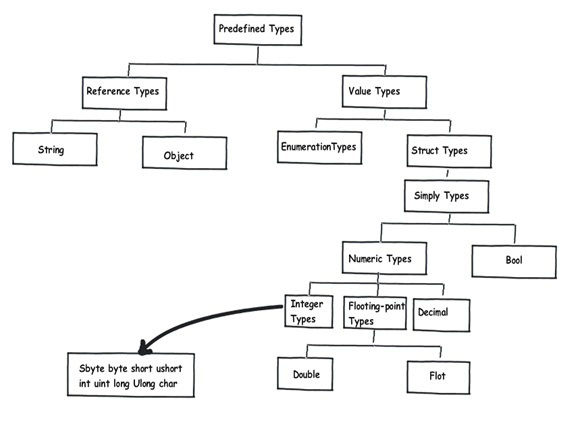 Value types are types which hold both memory & data on the same location i.e Stack. 2. Below we assign an int value (i) to another int value (y). Both these memory are separately allocated on stack. So if we change either of them then other doesn’t change. This is Value type. 1. A reference type has a pointer which points to the memory location. 2. Now when we create an object and assign an object to another object, they both point to same memory location (in heap). So if we change one of them, the other object is also affected. This is Reference type. When we move data from Value type to Reference type, data is moved from Stack to Heap. It is termed as Boxing. 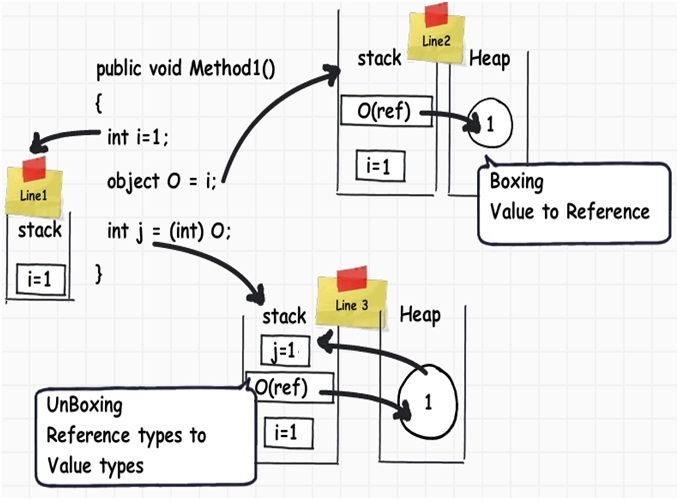 When we move data from Reference type to Value type, data is moved from Heap to stack. It is termed as Unboxing.